Home » Happening Now » Nutrition Scale Giveaway! A few weeks ago I found the Perfect Portions Nutrition Scale for sale over at ThinkGeek.com. I immediately contacted them because I thought this could be a great tool for healthy eating, and I wanted to share it with my readers. They agreed, and the very next day a free sample was on its way. This glass-top scale is pretty slick. You simply place your food on the scale, look it up in the accompanying book, and punch in the code. That enables the scale to give you detailed nutrition information for your “perfect portion.” It does the math for you (hey, I thought geeks liked math! 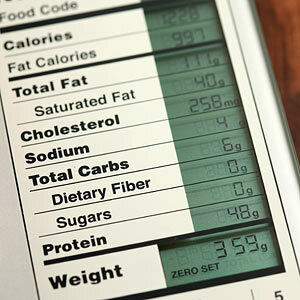 ), giving you get a quick readout of calories and all the other macronutrients in the food in front of you. Sure, it might be a bit of a hassle to look up each code, weigh it, and figure it all out. However, I see this as a great tool for someone who really needs to watch their numbers carefully. Or better yet, for someone who wants to learn the numbers — so they can better eyeball servings later. Unfortunately, we have a tiny kitchen. Our cabinets are carefully crammed, and our counters are currently consumed by a cornucopia of jars of nuts, whole grains, cereals, and loose-leaf teas (Speaking of which: If you’re ever in Paris, don’t miss Mariage Frères, a magical tea shop in the Marais). 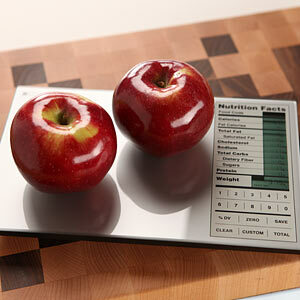 Kitchen scale weighs food, monitors carbs, salt, calories, cholesterol and more! To enter the giveaway, simply share a healthful holiday gift idea in the comments below. For another entry, tweet about the giveaway, including a link to this post and my twitter username, @eatingrules. Then come back here and leave an additional comment with a link to your tweet. For another entry, share this post on Facebook. 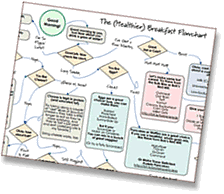 Please leave an additional comment to let me know you’ve shared it. Contest ends at 11:59pm PST on Friday, December 17th. I’ll go to random.org and pick the winner shortly thereafter. I will then notify the winner via email, and request his or her mailing address. The winner will have four days to reply with their mailing addresses, or I will pick a replacement winner from the list. (If you get back to me over the weekend, I will ship it on Monday via Priority Mail so you can have it in time for Christmas!). This giveaway is open to U.S. Residents only, since I am limited to shipping within the U.S. Huge thanks to Think Geek for donating the nutrition scale! Instead of holiday cookies this year, I’m using my food dehydrator to dry fruit. I’m seasoning apples, pears, and some other great fruits and then making some sweet and delicious fruitful confections. Wrap them in some cheesecloth (to avoid plastic or cellophane, tie with a ribbon and voila! We’re giving gift packs to our family and friends of our favorite healthy Bob’s Red Mill items- steel cut oats, whole grain pancakes, flaxseed meal and hard white whole wheat flour. I’m baking all my holiday cookies using whole wheat flour this year too! One of my favorite “healthy gifts” was a heart-rate monitor watch.